There is no brand more quintessentially synonymous with British fashion than Burberry. The storied luxury fashion house has a heritage 161 years deep since it was founded by Thomas Burberry in 1856. 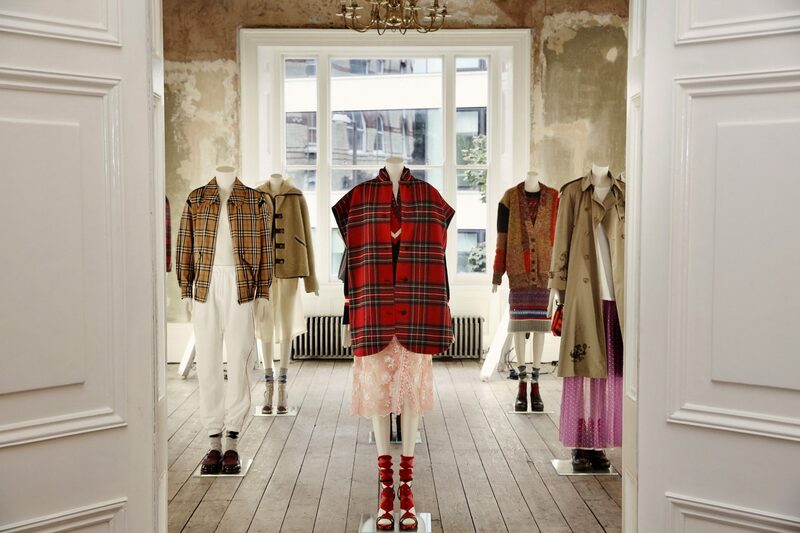 For its Burberry September 2017 collection, the brand’s chief creative officer Christopher Bailey took a page out of 20th-century history books and revisited its British roots — bringing to life tartan patterns, cartoon-sketch prints, and the iconic Burberry vintage check. The inspiration for the collection stems from the spirit, style, and culture as seen in British social portraiture of the 20th century, particularly in the works of celebrated photographers like Alasdair McLellan, Gosha Rubchinskiy, and Shirley Baker. The photographs are also part of a bigger exhibition at Burberry’s new show space, the Old Sessions House at Clerkenwell. Titled Here We Are, over 200 photographs are on display, curated by Bailey, McLellan, and Lucy Kumara Moore, director of Claire de Rouen. Regality reigns supreme in this ceremonial outfit, as seen on model Alderney Street. And indeed, the clothes and ensembles sent down the runway by Bailey during London Fashion Week did have an air of British-ness: The baseball caps in check and tartan prints, oh-so-comfortable cashmere coats, and shearling wool ceremonial wear that wouldn’t look out of place in a Buckingham Palace wardrobe. Model Ella King muses backstage in an oversized plastic car coat, cashmere cardigan, and the Giant reversible tote bag. One of the key fabrics in this collection (besides the usual wool and cashmere) is plastic. A rainbow of sorbet shades is offered in the form of ponchos, cagoules, and oversized car coats. The lightweight, waterproof material is perfect for the rainy days that are coming our way, and the seams are embossed for a tailored, topstitch effect that makes it virtually threadless. Lets not forget the utilitarian bags and pouches that come in a variety of colours. Two sizes of the Giant reversible tote bag, giant and medium, are patterned with tartans or checks and come in either leather or cotton. The reversible nature of the tote bag allows you to switch up the colours depending on your mood, and you get two bags in one — a great deal, if you’d ask us. 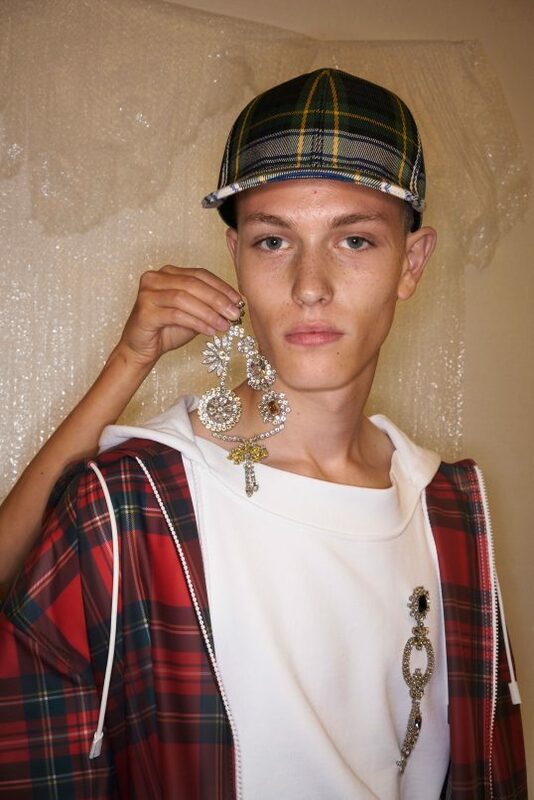 Davy Swart cheekily posing backstage with a crystal daisy chain chandelier earring, while wearing a chandelier brooch himself. Another sparkling star of the show was the sparkling crystal jewellery adorned on both the mens and womenswear. Spanning brooches, pins, and earrings inspired by British gardens, these glittering pieces mark Burberry’s first foray into jewellery. Many of them can even be worn pinned on scarves and sweatshirts for visual interest. The Burberry September 17 collection marks one year since the house started its ‘See now, buy now’ business model, and you can shop the entire runway now both online and at all of Burberry’s stores globally.